This is another spectacular walk which follows the sangle path to the Roman Inscription, and allows us to explore the southern half of the l'Aup Seuil. It deserve its grading, for it includes a little bit of scrambling, and some very exposed walking, but if you're reasonably fit, agile, and have a reasonable head for heights, it's a walk to be savoured. However - be warned: do avoid this route in wet weather, or whenever there is likely to be ice or snow around. The time given is for the full walk. The route starts from a forestry road above St Philibert (map), climbs up to the Roman Inscription - a pass mid-way along the western crest of the Aup Seuil, traverses the southern half of the upland basin, ascends to the top of the col de Bellefont, and returns down the valley back to the car. St. Philbert is an attractive village spread across the D512, midway between the two St. Pierre's. Take the forestry road heading east opposite the cemetery, and drive up this for 2½ km until a small parking space may be found on the left just before the signs that indicate that the rest of the road is barred to ordinary traffic (1135 m, grid ref. UTM 31T 72410 50274). Take the road past the barrier, and after ten minutes it descends to the level of the stream. Cross the bouldery stream bed to the track opposite. This soon divides - keep left. After a few minutes this develops into a path which climbs gently along the flank of the valley. It crosses a couple of forestry tracks in the first 20 minutes or so, where you'll have to look around for the continuations. Some ninety minutes after leaving the car the forest thins out, and the path reaches the alpine meadows. This is where the fun starts, and the next couple of hours should be savoured. The path sweeps up a couple of zig zags to reach the base of some cliffs, which it follows to the north before dropping steeply down to a ledge - this is somewhat exposed, but there are some helpful iron railings. The path then descends steadily to enter the Cheminée de Fontanieu, reached some 30 minutes after entering the alp. This is a narrow gully, some three or four metres wide, which rises for some 200 metres through the cliffs. Just above the entry point, a cave in the north wall passes impressively right through the arrête into nothingness - a place to avoid! Below, the gully drops down a cliff. The path crosses to the left hand side of the gully, ascends a handrail section, and then ascends steeply on a loose path, sometimes accompanied by cables. 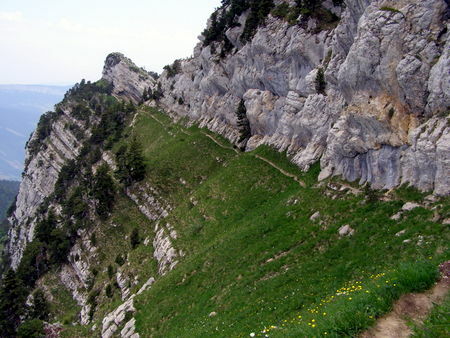 The exit is made onto a short, subsidiary ridge, which is crossed to arrive on a terrace, high up on the cliffs of the west wall of the Crête des Lances de Malissard. The path heads south, with some disconcertingly impressive views, as it follows the base of cliffs, and sometimes meanders onto the other side of the crest. The St. Bruno lily is common on this terrace. After some 45 minutes of spectacular walking, the base of a rock chimney is reached, with much metal work in place. This needs to be ascended - it is Difficulty 3, and a 20 metre rope is useful for those who lack confidence in such situations. It leads to a narrow col on the crest (1900 m), and hence down to the Roman Inscription. It has taken some 3½ hours (with breaks), to reach this point, and the bulk of the work is now over. Just below the crest is the Roman Inscription itself, engraved into the rock, and picked out with red paint. It is reputed to date from the first or second century, and marked the boundary of the lands of the Aveien people. It is not difficult to reach the inscription by the way we are going to descend, but if the inscription is genuine, having a territory marker here implies that this was a major route over the crest 2,000 years ago. Follow the path down the scree to the base of the cliffs, and then round to the right into an attractive prairie, through which it meanders to reach the GR9 in the valley below (1610 m) - the Vallon de Marcieu. We now follow the path to the south, through a large area of pasture with several ruined bergeries nestling under the cliff wall, and then through a beautiful area of impressive limestone boulders, before entering a large enclosed basin of pasture beneath the col de Bellefont. The ascent up to the col (1902 m) is well contoured, and is reached some two hours after leaving the Roman Inscription. Looking back from the col, you can see the four discrete sections of the Aup Seuil. Immediately below is the sheltered, enclosed pasture nestling under the steep walls of the col; beyond is an area of prarie with limestone towers and pinnacles; beyond that is the large area of high altitude pasture; and finally, the forest-covered lapiaz leading to the edge of the Cirque de St. Même. At the col, turn left to find the path that descends the pasture to the Cabane de Bellefont in wide-sweeping zig zags. There is a water source alongside the cabane (1650 m) - the first since we left the car - so it's a useful place to stop and refill water bottles. From the Cabane follow the path sign-posted col de la Saulce. This sweeps round the head of the Perquelin valley, before descending to reach the col (1481 m) after about 20 minutes. From here we turn right towards St. Philibert. The original path gently zig-zagged its way into the valley, but it has been largely destroyed by a newer forestry track. This, however, is not too steep and within 30 minutes the tarmac road and the car is reached after a wonderful walk.